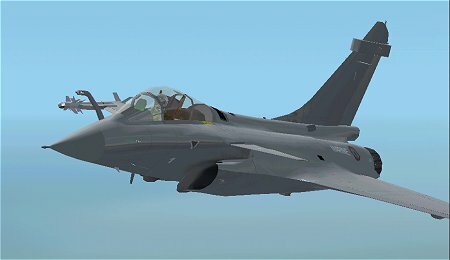 A couple of months ago announcements started popping up in the French language Flight Simulator forums from a developer named "Gator" for a new Rafale under construction. These announcements also included in-flight screenshots of what looked like an aircraft that was ready for release even then. But as Cyril Pioffet (Gator) explained, there was still much to be done. Now it is finally here and it is well worth the wait. I'm sure my video card and these resulting images do not do this one justice. 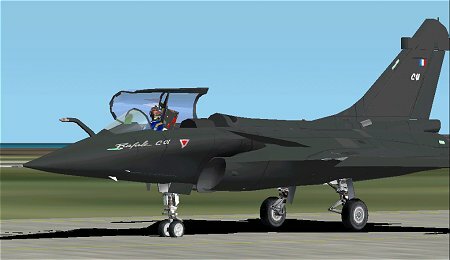 It is a very well made model of the latest in the long line of Dassault fighter aircraft. The aircraft handles very well. There is only a slight fluttering at speeds over 900 kts but it is very mild. 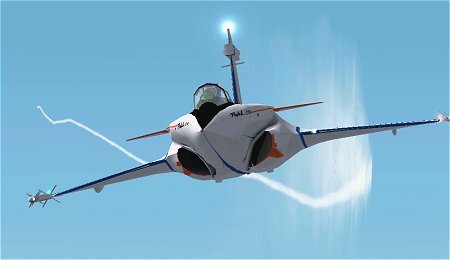 There is no visible afterburner effect, but the diameter of the exhaust nozzles does change with the throttle settings. Acceleration is very fast and before you know it you'll find yourself above FL300. 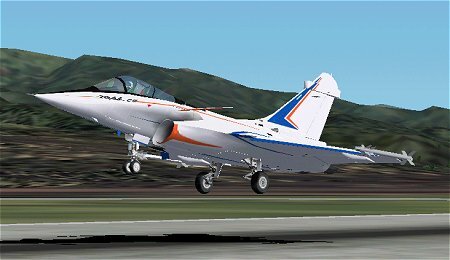 Cyril made his Rafale using GMax. The aircraft has been fully animated. The textures of all three versions have been made reflective. There are actually five aircraft included in the package; optional versions with in-flight refueling probes are included for the Rafale A and Rafale C. The probe is standard on the Rafale M (left). In aircraft selection Cyril has called this one the Rafale A because it wears the original Prototype colors of the 1980s. Refueling probe options are included for the C and M versions. The gear retraction sequence is very quick and smooth leaving very few doors open to cause drag. The canopy opens and closes (Shift-E) with a nice pause at the beginning and end of the sequence. Once the canopy is up the pilot's visor is raised and he looks to the left. The landing gear is well detailed and includes the differences between the Rafale C (Armée de l'Air) and Rafale M (Aéronavale). The Virtual Cockpit (VC) is very well done. 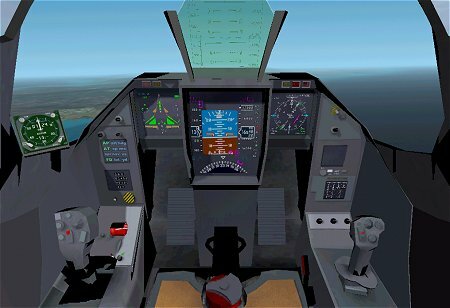 All of the instruments from the 2D cockpit are still functional in the VC. The Head Up Display (HUD) and Intercept radar are from Eric Marciano's F-16 which was a result of his work on the Mirage 4000 with Romain Lucas. The glass MFD gauges and rear view mirrors have convincing reflective textures. Header image Copyright Dassault Aviation.